Four Seasons Hotel Denver – Denver, Colo.
Four Seasons Resort Orlando at Walt Disney World Resort – Lake Buena Vista, Fla.
Rancho Valencia Resort and Spa – Rancho Santa Fe, Calif. The Langham, Chicago – Chicago, Ill.
Palme d’Or – Coral Gables, Fla.
Saison – San Francisco, Calif. Twist – Las Vegas, Nev.
AAA has unveiled 121 hotels and 63 restaurants that have earned the AAA/CAA Five Diamond Rating in the past 12 months, qualifying them for the 2015 Five Diamond Award lists. This exclusive group represents just 0.3 percent of the more than 58,000 AAA/CAA Approved and Diamond Rated hotels and restaurants. Of note among the new additions to the 2015 list is the Orlando area’s only Five Diamond hotel, the Four Seasons Resort Orlando at Walt Disney World Resort, marked by numerous upscale service options. Each room is equipped with an iPad that serves as the radio, resort map, event guide and newspaper, as well as a Bose Bluetooth speaker system and high-tech keypads that control lighting, air temperature and even guests’ request for privacy. For additional custom luxury, guests can create their own fragrance at the spa’s Aroma Design Bar. At the Shangri-La Hotel in Toronto, the guest room drapes, bedside lighting and air-conditioning system are all electronically controlled by the guest. In-room iPads are available to order room service, call housekeeping or contact the 24-hour concierge. The best high-end restaurants are fast becoming international destinations by providing a unique dining experience in which the selection and enjoyment of exceptional food is also an educational event. Typically, Five Diamond restaurants are ahead of trends in farm-to-table and super-local food sourcing. Directed by artistic whims, the chef creates solid, lifelong relationships with farmers, purveyors and producers who can deliver the finest ingredients, whether it’s coffee, olive oil or artisan cheeses. At the Inn at Little Washington Dining Room in Washington, Va., for example, AAA’s longest tenured Five Diamond restaurant, Chef Patrick O’Connell uses as many local ingredients and foods as possible, along with bounty from his own garden, applying masterful techniques to create captivating results. At Eleven Madison Park in New York City, diners are invited to build their dinner around specific ingredients instead of predetermined recipes. But it’s the service experience that shines brightest as guests are pampered in a manner that is intimate yet relaxed. With personalized service or surprising insight, each staff member adds a special touch to the guest’s dining experience, creating a powerful, memorable event. Currently only .4% of all AAA rated hotels achieved the Five Diamond Rating. 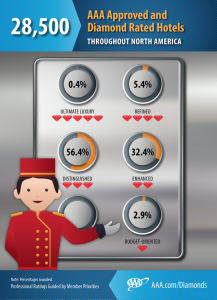 Only 5.4% of all of the AAA rated hotels achieved the Four Diamond Rating. AAA rated 28,500 hotels for 2015. 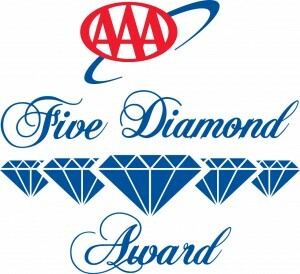 This entry was posted in News & Notes and tagged AAA, AAA Five Diamond by TrueGuest. Bookmark the permalink.